Store the keys of locked-out devices in ACCUFORM SIGNS Portable Group Slot Lock Box. The slot-style box has 12 slot holes on the top lid, allowing authorized workers involved to secure a personal padlock (sold separately) to ensure that no one person has access to the keys in the box until they have removed these padlocks. 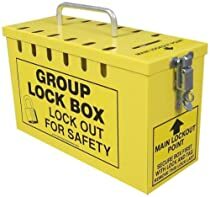 The Portable Group Slot Lock Box also features a lockable closure, top key slot, and carry handle for portability. The yellow, sturdy steel box measures 10" x 6" x 4-1/4". Yellow, steel slot lock box measures 10" x 6" x 4-1/4"